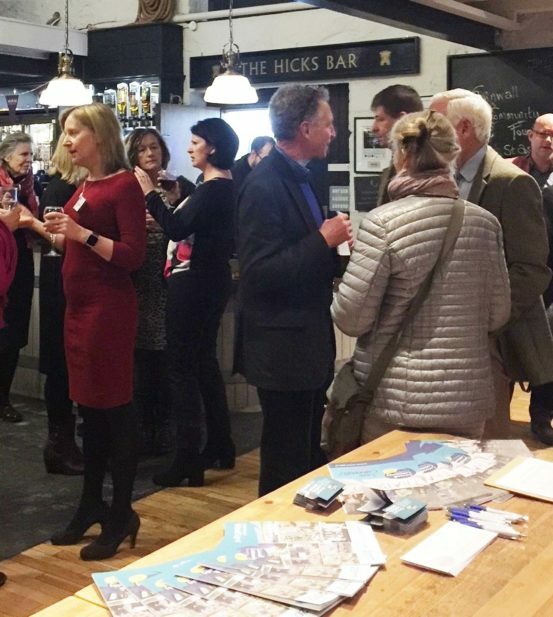 Our annual Friends and C100 Business Club Drinks Party was held on 7 February at St Austell Brewery Visitor Centre. We are very grateful to our Friends and C100 members for their ongoing support and the annual party gives an opportunity to celebrate this success story. CCF Chairman, Jane Hartley, welcomed a large gathering of guests and thanked them for their continuing support. With real-life examples of deep community need in Cornwall she demonstrated how the Friends’ and C100’s support for the Foundation impacts to strengthen communities and improve lives. Chief Executive, Tamas Haydu, highlighted changing social needs identified by CCF’s recent Vital Signs report. He explained that CCF is keen to ensure that grants awarded align to needs as much as possible. The Cornwall 100 Club is a group of like-minded businesses who along with taking corporate social responsibility seriously, also want to invest in their community. Since its inception ten years ago the business club has invested more than £250,000 in community projects in Cornwall and the Isles of Scilly, supporting over 250 local organisations. The event was kindly supported by St Austell Brewery.